The fourth and last magnum of our New Year’s day gathering has a label that provokes clear expectations. 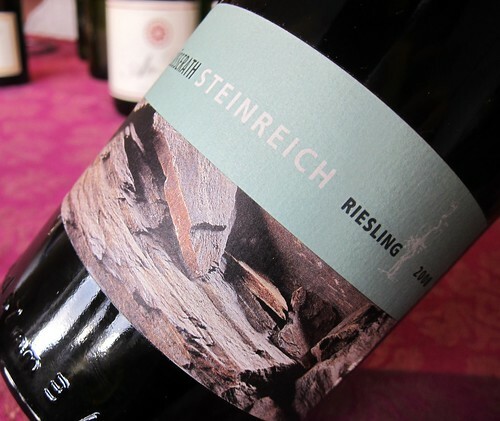 A stone-wine, a mineral-loaded elixir is also what probably anyone who speaks German instantly thinks of when he sees that the wine is named “Steinreich“, which translates to “rich in stones” (“empire of stones” would be another possible translation). According to the Ansgar Clüsserath estate who made the wine, the name should recall the soil of the famous Trittenheimer Apotheke site where the vines stand on masses of blue slate and rocks. The winemaker in charge is Eva Clüsserath-Wittmann, the daughter of the estate, who interestingly is married to Rheinhessen-winemaker Philipp Wittmann. 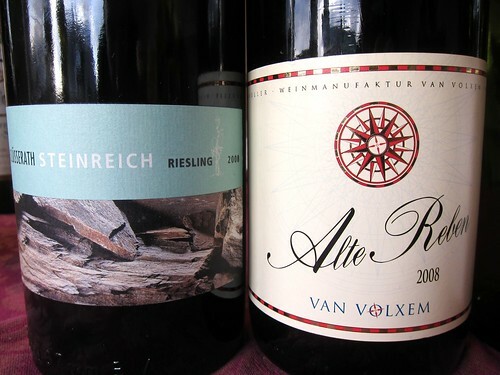 On that night, this dry Mosel-Wine had to compete directly with the Van Volxem Alte Reben, the Riesling from the nearby Saar river we popped open just before. Not easy. Well, looking into my archives, I discovered that I already once drank a Steinreich (not that I forgot), and my short note tells me that I liked it. it was a 2007 vintage, and I had it in 2008. Drinking a 2008 in 2012 should be quite a different story. This wine has an odd nose. It is really intense with aromatics of fresh (meaning non-fermented) grape juice. Very intense actually, but somehow grape-juice in a wine doesn’t excite me too much, especially when being compared to the smoky and juicy nose of the Van Volxem. Also, there was no slate smokiness, as would be typical for Mosel wines, and the spontaneous fermentation notes, announced by the online-shop’s description, were missing as well. On the palate, the grapy fruit is wrapped in a silk-like body and there is some nice minerality. Certainly, a very good thirst quencher and with its low alcohol, also a welcome refreshment. But next to the Van Volxem this wine stands no chance. 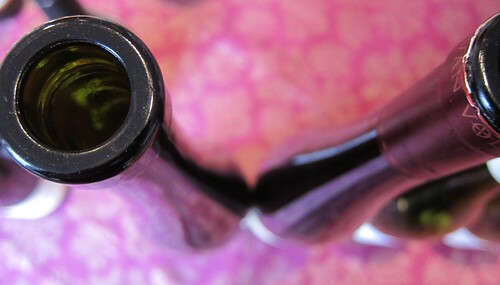 What strikes me most, is a certain lack of tension within the wine: it shows a bit flat. Of course, one shouldn’t underestimate the fact that it has been drunk next to other wines that night and that this could have distorted its true nature. One thing is sure: it’s not a bad wine, but apparently not suitable for this comparison. Between the two, there’s one clear winner!